Thickenings can appear in the palm of the hand and the fingers and these may become tight, causing fingers to bend. This is Dupuytren's disease. It typically runs in families and may have originated amongst Viking populations. It occurs spontaneously although it can occasionally be triggered by a small injury or operation. The contracted finger(s) make some functions difficult (putting hand into pocket, manipulating certain objects). The contracture never settles on its own and usually continues to worsen - sometimes quickly and sometimes slowly. Although it is not a dangerous condition, the longer it is left untreated, the more difficult it is to get a good result because the bones and ligaments of the finger joints start to be damaged. If the hand cannot be placed flat on the table it is advisable to seek specialist treatment. Open surgery, which can be performed as a daycase awake procedure, is considered to be the 'gold standard' in terms of minimising the chances of recurrence because it removes most of the abnormal thickened tissues. It has the disadvantage of requiring dressing changes for 2-3 weeks after surgery and specialist hand therapy for 2-3 months. Alternative treatments interrupt the tight tissue without removing it. This is done either by using a sharp needle to sever the tissue (needle fasciotomy) or by using a powerful enzyme (Xiapex) to dissolve small sections. 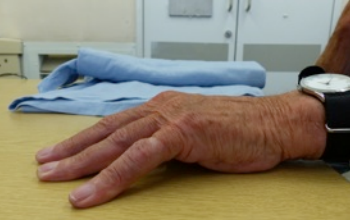 These techniques allow fingers to be straightened but do not remove the tight dupuytens tissue. As a result there is a greater chance of recurrence and also a small chance that the bend in the finger will be barely corrected. In addition, they are not appropriate for more complex cases. Despite this, the convenience of these alternative treatments makes them an appealing choice for many patients. 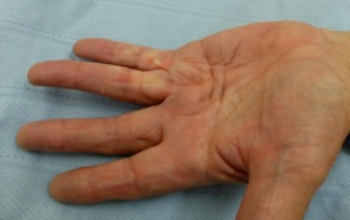 A typical case, mild but significant contracture of ring finger and also little finger caused by thickening and tightening in the palm. It is not possible to place the hand flat on the table and treatment is therefore appropriate. The patient opted for a "needle fasciotomy". Under local anaesthetic, the tight tissue was released with a sharp needle. The procedure takes only a few minutes. 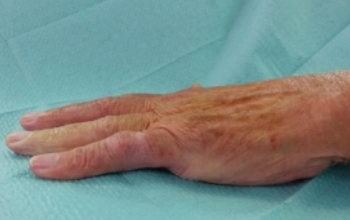 It is immediately possible to move and use the hand after treatment. No bandaging is necessary, only a sticking plaster for a couple of days in most cases. The hand can now be placed flat on the table after successful needle fasciotomy.